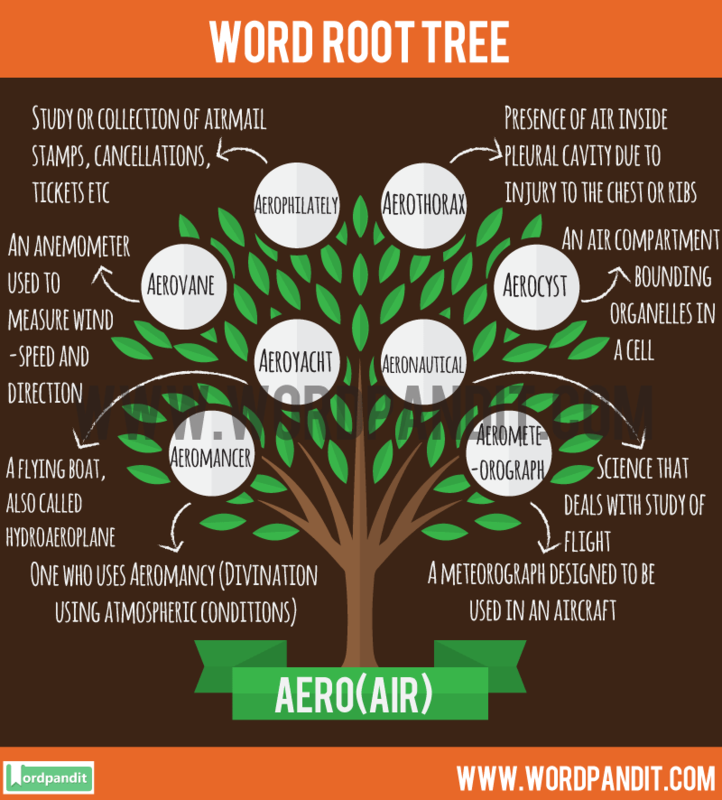 What does Aero Root Word mean? It is fair to say that words with the word root –Aero are mostly used in reference to air . Aerodynamics is used to design an aeroplane. 1. Aeroacoustics : A branch of acoustics that studies noise generation due to the interaction of aerodynamic forces with surfaces. 2. Aeroatelectasis : A condition in which a lung of pilots collapses partially. 3. Aerobeacon : A light which warns aircrafts at night from tall buildings. 5. Aerobridge : Elevated corridor connecting airplane to the airport. 6. Aerodontalgia : Pain in teeth caused by change in air pressure. 7. Aeroembolism : An embolism(obstruction of blood vessel) caused by formation of air bubbles in blood. 8. Aerogenous : Anything that can be transmitted through air. 10. Aerolith : A term given to a meteorite. 12. Aerometeorograph :A meteorograph designed to be used in an aircraft. 13. Aeronautical : Science that deals with study of flight. 14. Aerophilately : Study or collection of airmail stamps, cancellations , tickets etc. 15. Aerothorax : Presence of air inside pleural cavity due to injury to the chest or ribs. 16. Aerovane : An anemometer used to measure wind-speed and direction. 17. Aeroyacht : A flying boat, also called hydroaeroplane. 18. Aerocyst : An air compartment bounding organelles in a cell.